Santa Ana’s Observatory OC (3503 S. Harbor Blvd) will host the massive Dimebash 2019, fueled by Monster Energy, on Thursday, January 24, 2019! The event will be hosted by Sirius XM’s Jose Mangin, and in addition to Monster Energy, is sponsored by Affliction, Metal Blade Records, Dean Guitars, ddrum, California’s Finest and BackBeat BBQ. 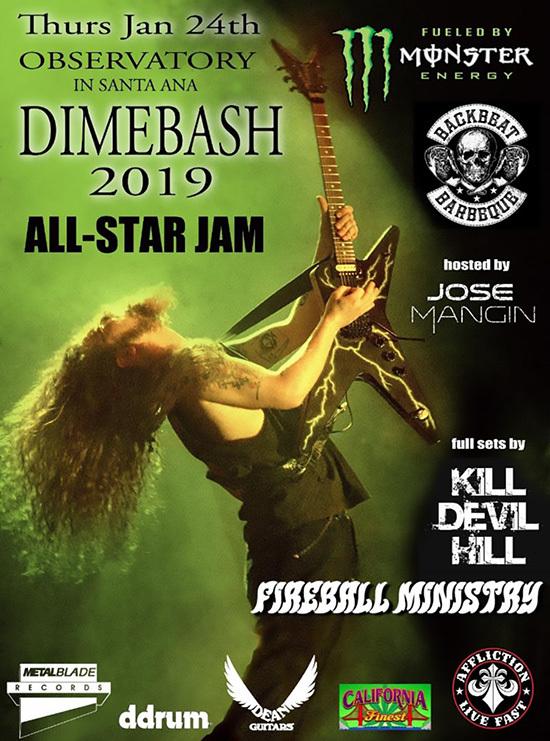 As previously announced, Dimebash 2019 will feature an All-Star Jam of top musicians performing Dime’s music and his favorite tunes! This year’s All-Star Jam will feature 55 of rock and metal’s absolute premier musicians of today, including Dave Grohl, Corey Taylor, Rex Brown, Scott Ian, Charlie Benante, Dave Lombardo, Chris Broderick, Gene Hoglan, Tony Campos, Jason Bittner, Nita Strauss, Art Cruz, Jason Christopher, Dug Pinnick of King’s X, Ra Diaz of Suicidal Tendencies, Sen Dog of Cypress Hill, Christian Brady and Kyle Sanders of Hellyeah, Tommy Vext and Doc Coyle of Bad Wolves, published author Jeremy Wagner also of Broken Hope, Courtney Cox of The Iron Maidens, Joey Vera, Gonzo and Phil Sandoval of Armored Saint, Randy Weitzel of In This Moment, Wes Hauch of Glass Casket, Pro Freestyle BMX star and Good Guys in Black vocalist Rick Thorne, Kyng and many others! Dimebash will also feature individual performances by Kill Devil Hill and Fireball Ministry. Many great raffle prizes will be available to win throughout the night, along with a chance to win a seat at the picnic table at the exclusive Artist’s Afterparty! The private afterparty will take place after the main event, and will feature Dave Grohl’s BackBeat BBQ cooking up a monstrous feast with some acoustic entertainment by Kyng (and maybe another familiar face… or three)! Right now, fans can order Dimevision Vol 2: Roll With It Or Get Rolled Over, the follow up to the poignant first Dimebag Darrell video memorial set, Dimevision Vol 1: That’s The Fun I Have, via Metal Blade Records. 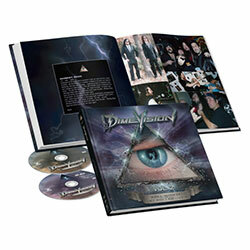 Dimevision Vol 2: Roll With It Or Get Rolled Over is a true celebration of Dimebag and how he lived his life. The DVD/CD set – which includes more footage, true gems and classic moments – also includes five previously unreleased demos, picked from a vast catalog Dimebag accrued since longtime girlfriend Rita Haney gave him his first 4-track in 1984. Dimebag’s personally-written lyrics, dates and notes on those tracks are also included.